, brother to the above, was born a Bristol in 1645, and educated at Corpus Christi college, Oxford, of which he was elected. fellow; he afterwards became chaplain to Dr. Henry Compton, bishop of London, who collated him, Nov. 4, 1680, to the rectory of Thorley in Hertfordshire, and Dec. 20 following, to the archdeaconry of Essex; and in 1682, to the prebend of Mapesbury in St. Paul’s. 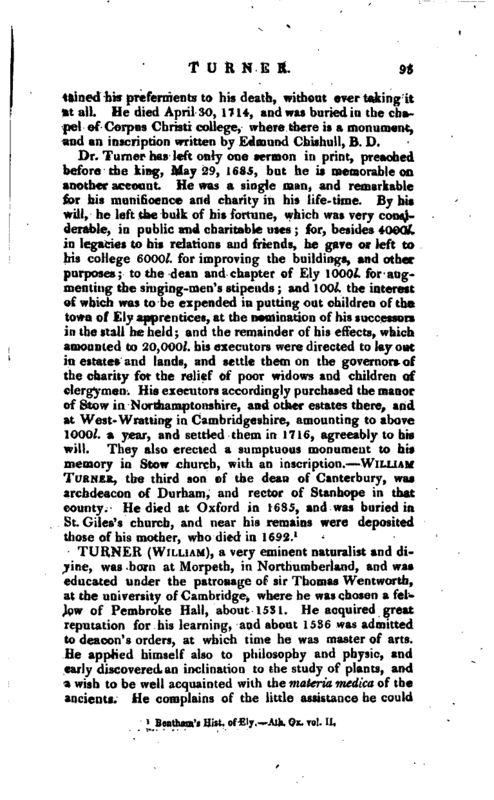 He commenced D. D. at Oxford, July 2, 1683, was collated by his brother to a prebend of Ely, March 26, 1686, and elected president of Corpus, March 13, 1687-8. 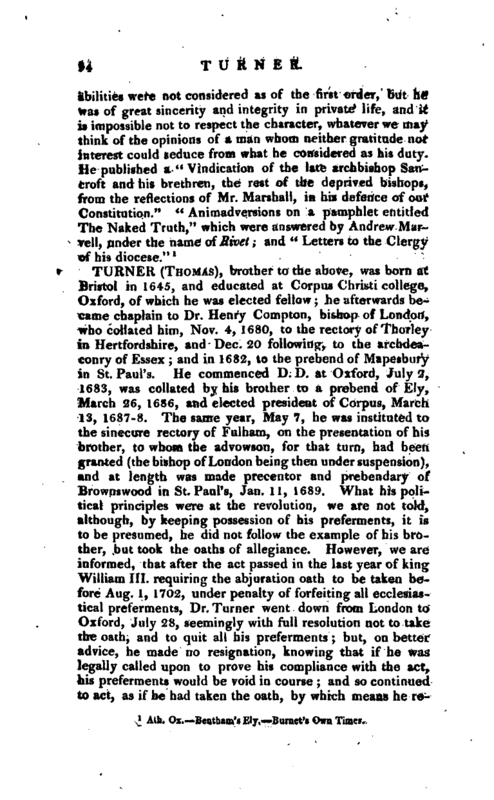 The same year, May 7, he was instituted to the sinecure rectory of Fulham, on the presentation of his brother, to whom the advowson, for that turn, had been granted (the bishop of London being then under suspension), and at length was made precentor and prebendary of Brownswood in St. Paul’s, Jan. 11, 1689. What his political principles were at the revolution, we are not told, although, by keeping possession of his preferments, it is to be presumed, he did not follow the example of his brother, but took the oaths of allegiance. However, we are informed, that after the act passed in the last year of king William III. requiring the abjuration oath to be taken before Aug. 1, 1702, under penalty of forfeiting all ecclesiastical preferments, Dr. Turner went down from London to Oxford, July 28, seemingly with full resolution not to take the oath, and to quit all his preferments; but, on better, advice, he made no resignation, knowing that if he was legally called upon to prove his compliance with the act, his preferments would be void in course; and so continued to act, as if he had taken the oath, by which means he | retained his preferments to his death, without ever taking it at all. He died April 30, 1714, and was buried in the chapel of Corpus Christi college, where there is a monument, and an inscription written by Edmund Chishull, B. D.
Bentham’s Hist. of Ely. —Ath. Ox. vol. II.